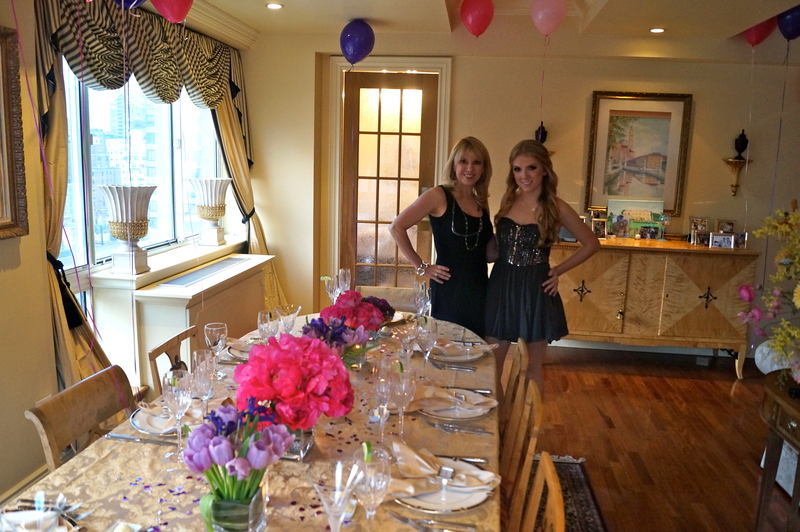 A couple of weeks ago, we celebrated Avery’s birthday with a dinner party for her girlfriends at our home. 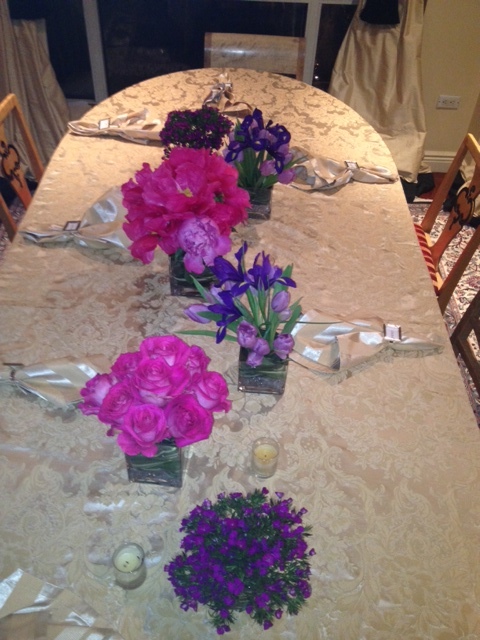 I did the flower arrangements myself and many of you asked for details on how I did it! 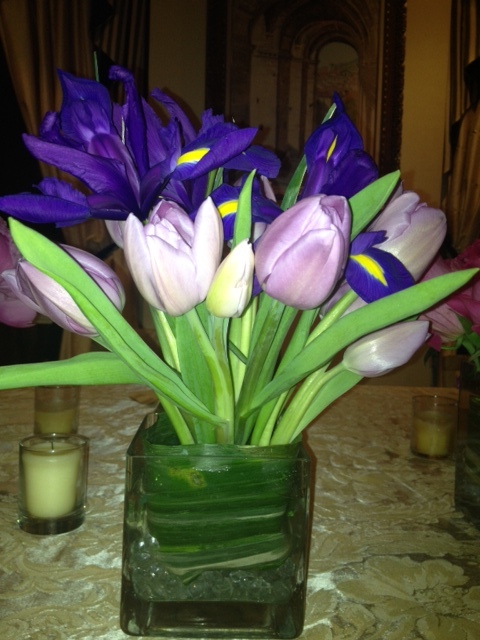 Flowers are one of my passions. 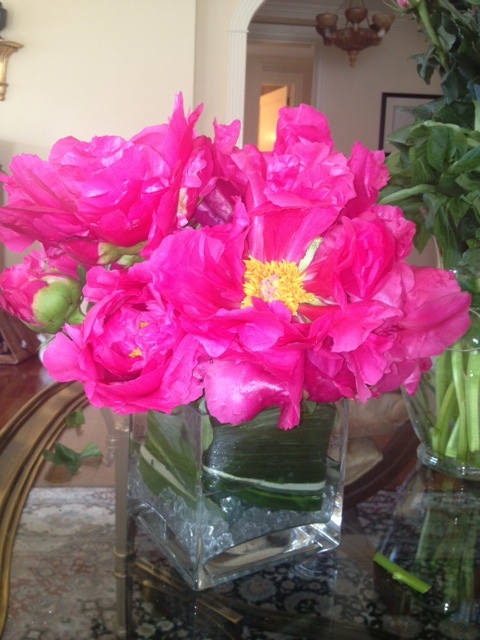 I love gardening at my Hamptons’ home, cutting fresh flowers, taking long walks through the flower district. Its a great thing to use some creativity. I wanted to move away from the classic arrangement for this party. Avery is young and fun so thats what I wanted to capture. 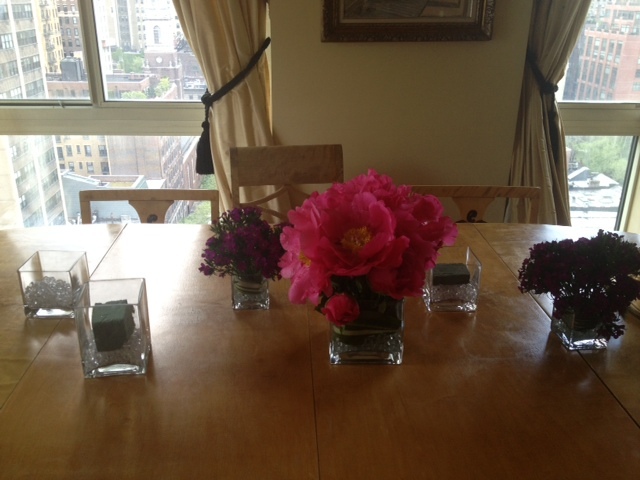 I wanted the table to look eclectic! 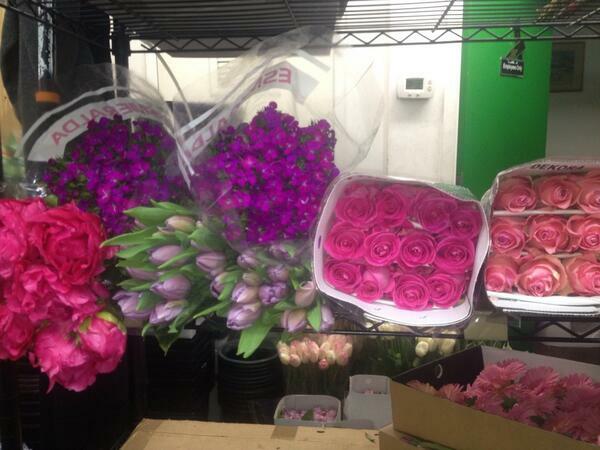 I spent an afternoon strolling through NYC’s Flower District which is located on 28th Street between 6th and 7th Ave. I picked up some green floral foam, exotic green leaves, crystal beads and a bunch of flowers. I went with pinks and purples but instead of the same type of flower I did multiple different types. 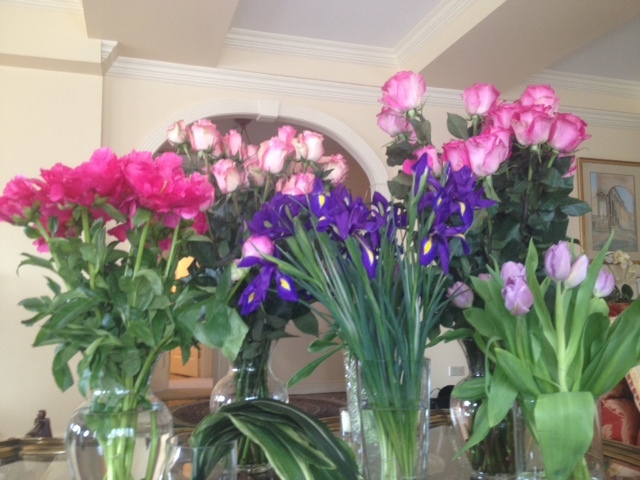 When I arrived home, I pulled together all different size vases. I cut the floral foam to fit each vase and then saturated the foam in water. While the foam was saturating, I cut all of the flowers to the sizes I wanted them to be in each vase. This is,of course, is a matter of preference. 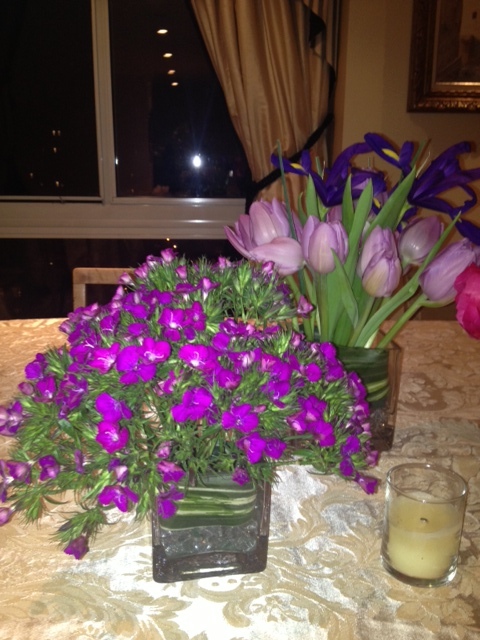 When the flowers were cut, I put the crystal beads at the bottom of each vase. I then took the saturated floral foam and wrapped it in the green leaves, placing them in each vase. Once this is complete, I began sticking the flowers into the foam. 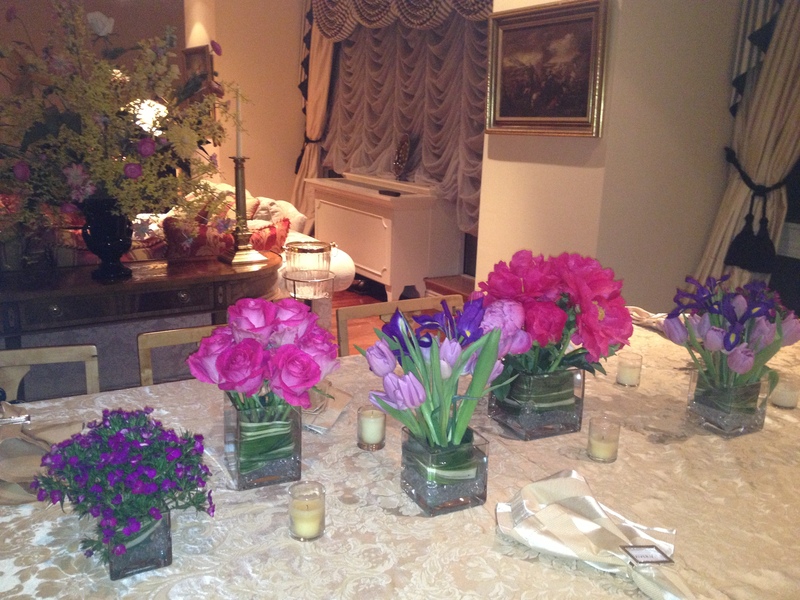 When I have all the vases complete, I began placing them on the table. How you place them depends on the look you are going for but I decided to scatter them a bit instead of putting them in a straight line down the center of the table. This is a really easy and fun way to make some different centerpieces. Avery was so happy with the final look and we had a great night!! Hello again! So as I sit here on another rainy day, I find myself daydreaming about the days of Summer right around the corner! So I thought I would take the time to share some of my beauty and style tips for the seasons changing. With the heat and sun coming, most of your products should change. A heavy foundation or an oil cleanser is not needed in the Summer. For cleansing purposes, I like to go with a really light and simple cleanser that won’t strip my skin of its natural oils but is also not adding too much moisture either. I use the Tru Renewal Gentle Gel cleanser followed by the Tru Renewal Oxygen boost. At night I will use the Tru Renewal moisturizer but in the day its BEYOND important to use SPF. I can’t stress this enough! A favorite of mine right now is Kate Somerville but any SPF will do! Foundation does not always hold well in the Summer heat and let’s face it, a fresh natural face is always best during those warmer days. During the Summer, I recommend using a tinted moisturizer that allows you to build for coverage. You are still able to use concealer for those “trouble areas” but your face won’t melt when you are out to lunch at that fabulous outdoor restaurant! I recommend Laura Mercier, both her tinted moisture (with SPF!) and the primer. Sephora has a great starter kit for a flawless face. Definitely try it! Is anyone else as ready for Summer clothing as I am? I officially took out all my Spring and Summer outfits but the weather did not come with it! Right now it’s all about black and white. You see it in the magazines, the store windows, its everywhere! 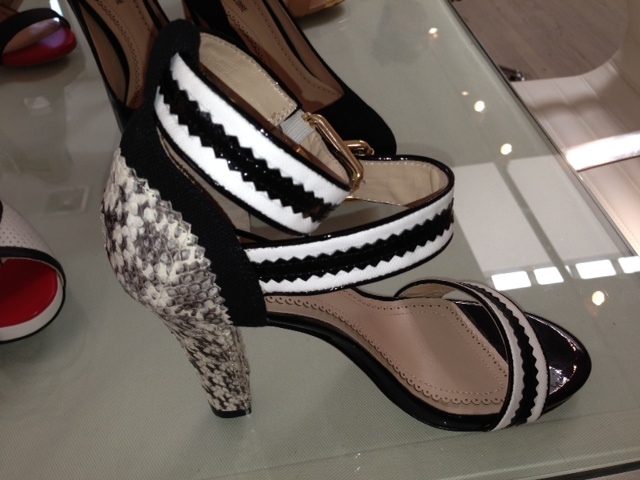 From shoes to tops, black and white are the statement pieces right now. Pour La Victoire has the BEST shoes. They are so comfortable, look like a million bucks yet affordable! They have some incredible statement shoes this season that will completely change an outfit. I truly believe you don’t need to buy a ton of new clothing to update your look. A pair of shoes will update you alone. So you have your black and white outfit and your statement shoes. 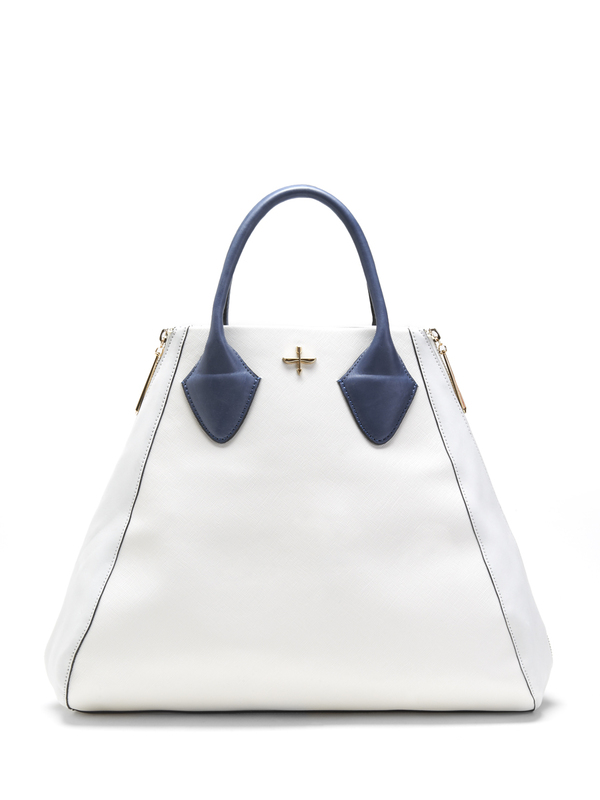 Now its time for a girl’s best friend, her bag! In the Summer, I am all about totes and Boho bags during the day. 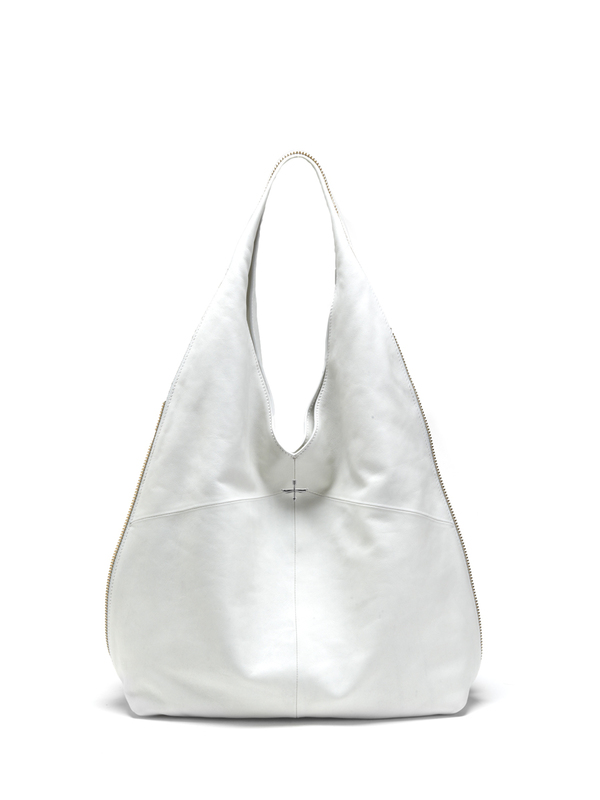 These bags are great because they are pretty much the Mary Poppins purse! You can throw in a cover up and some great sandals and head to the beach but you are also ready for a day of shopping and eating in town. When the weather is gorgeous, I want to go out and stay out which is why these bags come in handy. Stylish and so effective. Pour La Victoire has mastered these as well. So now that we are ready for the Summer, lets get the sun out! I hope you enjoyed my tips and find them helpful. Be sure to head to www.RamonaSinger.com to see videos of my showroom shopping as I try to update my style a little bit based on tips that you all have been sharing with me!